Professor Augustine is the African American Literature teacher and one of the Sophomore Seminar teachers. She is also a Bard High School Early College alumna. 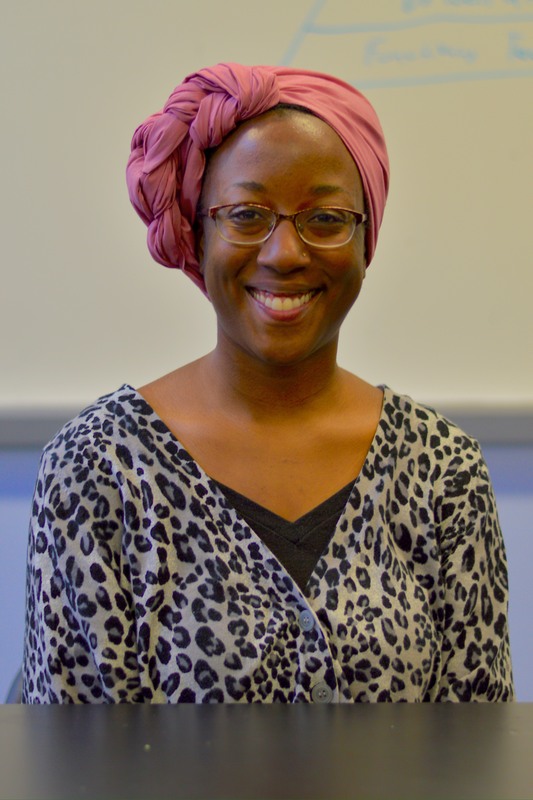 After graduating from BHSEC, she continued her education and graduated from Williams College, a small liberal arts college, and is now attending graduate school at NYU. At NYU she is writing her dissertation on her conception of Black childhood and youth studies. This has been her first year as a teacher at BHSEC and this interview will go through her experience here so far as well as provide some background on her. What did you know about BHSEC prior to being a student? Nothing. My mom found out about it from a flyer. She thought it sounded like a good fit for me and I would be able to thrive here. What was your experience like at BHSEC as a student? I loved it here, that’s why I came back! Some of my dearest friends I still have now are fellow BHSEC alumni. I also remember it being really hard at Bard, which informs a lot of what I choose to do as a teacher now, how I choose to design my classes, and how lenient I choose to be with my students. What have your first roughly three months at BHSEC been like as a teacher? I had my first real cry last night, but not due to feeling sad or as though I don’t belong. This is my dream place to be. My first real cry was because I have to adjust from being a grad student. It has really been a moment of expansion for me to open up, tap into my confidence rather than being isolated, quiet, unsure, or uncertain. Though expansion is something positive, it has been very difficult especially on my body to adjust and realize the huge responsibility I have. My one major challenge is feeling tired. But I remember being a teacher at Bard is my moment to give back while being surrounded by supportive and encouraging people. The student body is also a blessing. Students are responsive, invested, diverse, and honest. To have the responsibility of engaging and supporting that student body feels like an act of service. This is why I am grateful. What qualities do you add to BHSEC? My students and I have a running joke about me being the person who brings books to class that smell like incense and bath salts, which is something great to me. I have even brought the topic of who’s “woke” and who’s not to the table in class with my students. I am most concerned about using learning as a means to power and helping my students to analyze themselves. I want my students to be able to think about things like “What idea sounds good to me?” and actually get to learn about themselves rather than feed off of the thoughts of others. My students should feel comfortable being in disagreement with their peers. You may not know it but a lot of the students of color were and still are very excited and happy about having you here. How does that make you feel? Why? Wow, that’s so sweet. My African American Literature class is like a family. I remember the struggles I faced, not having a woman of color as a teacher. I try not to place too much responsibility on myself being a Black female teacher but I really feel that spark when I enter my class. I am aware of fostering a range in this environment that is already so challenging for my students. I think about all my students every day. What is the one thing you love the most at BHSEC? This is an institution that is really about expanding your consciousness. A lot of schools say that’s what they want, but Bard actually enacts it. I never really feel like I know exactly what’s going on in a room, but I love that. I love expanding. It’s a wonderful process. If you could change one thing about BHSEC now, what would it be? There is a very dense feeling that I get when I walk into this building. I see that many students struggle with the amount of pressure that they put on themselves. It is uncomfortable to see students in this condition because you guys are so young and there’s a huge importance in laughing, taking care of yourself, and enjoying life. Students should not be feeling stressed to the point where when I ask my students, “What are you doing this weekend?”and the majority of the answers are “work” and solely work. Being that you are a BHSEC alum, what is the biggest change that you’ve seen in BHSEC? It is bigger; there are more people here now. I feel like the students who are here now are more vocal or maybe I just never noticed how vocal Bard students were, being that I was a tunnel vision student. On the whole it seems like the student body speaks up a lot. What was your biggest lesson you took from BHSEC when going to college and your overall adult life? I got the discipline that I needed to take to the other level in college. I had time to develop an understanding and what I need in order to do well in class. This gave me an advantage when I went to college. I already knew myself really well. What does the future of BHSEC look like to you? I feel like Bard is the future. What we do here is the future. Our model is the future, which is why it always gets refined. My students are the future; they are the ones to change the world. I just open the doors to that. Who were your top three favorite professors at Bard? Who is your artist and why? If you could name one emotion that BHSEC makes you feel what would it be? Compassion. Everyday is an enactment of being passionate.